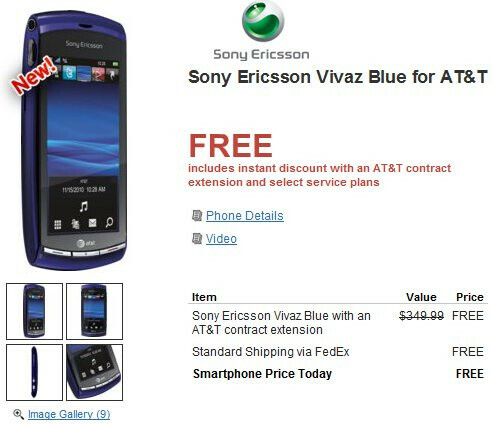 Although its $79.99 on-contract appearance on AT&T's lineup can be regarded as a fitting mark, the Sony Ericsson Vivaz is becoming the most affordable smartphone to pack along a decent camera in its shell. Now that Wirefly is selling the handset for free with an accompanying 2-year contract, it will not only aid the carrier to crank out some much wanted sales, but it can even spell for some high adoption rates of S60 in general here in the US. Packing along an 8.1-megapixel camera which is one of the few devices on the market to offer 720p video recording with continuous auto-focus, the free price tag only sweetens the offer – especially when you receive a fully capable smartphone. Even existing customer with a qualified upgrade can jump straight to this handset without having to pay a single penny – plus shipping is also included with the offer. So if you're in the market for a decent camera phone, make sure to put the Vivaz down on your list. If you want to make some easy money, get a free Vivaz and then sell it to SellYourCell.com and get $90 (prices change). You can either use your current phone on AT&T if you are happy with it. This is totally legal and ethical as the only thing AT&T really cares about is your signing the 2 year contract.